The news follows the company’s share price facing difficulties as the broader market declines. Peer-to-peer lender Funding Circle has announced the appointment of Goldman Sachs and Numis Securities as its joint corporate brokers. The news comes at the same time the company’s share price recovers from its third significant fall. Funding Circle’s shares have been trading on the London Stock Exchange for seven weeks but currently its price sits lower than that of its launch. Before completing its IPO, the company narrowed its price range to 440-460 pence per share. The share price has seen high volatility since IPO, following a more than 20 per cent fall on its second day of trading to 340p. 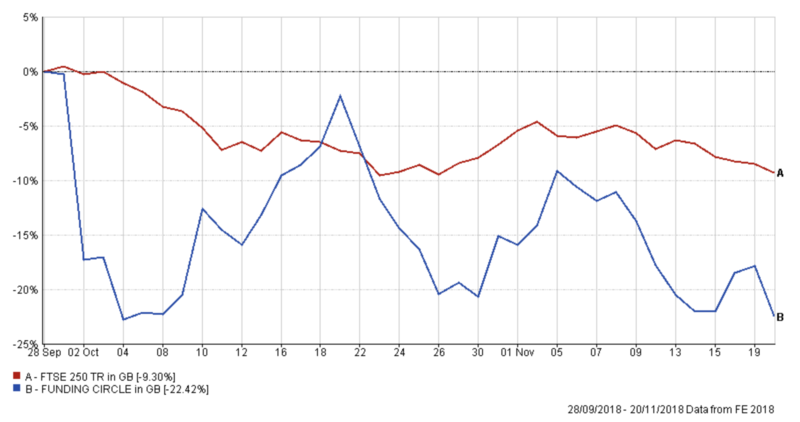 The broader market has also faced a decline since early October with the FTSE 250 having dropped nearly 10 per cent. Following the appointment of Goldman Sachs and Numis as the company’s corporate brokers, the share price is sitting around 345p. This value is 20 per cent less than its opening price and has experience twice the drop the FTSE 250 suffered. Funding Circle did outperform the benchmark in mid-October reaching highs of 430 pence following the release of the lender’s positive Q3 results.